It ain’t easy being a mobile game developer. Between developing an original, good-looking game to acquiring users, honing in on the right monetization strategy without bombarding users with annoying ads or in-app spam (hi, Zynga! ), while keeping engagement and retention up, leaves developers with their hands more than full. 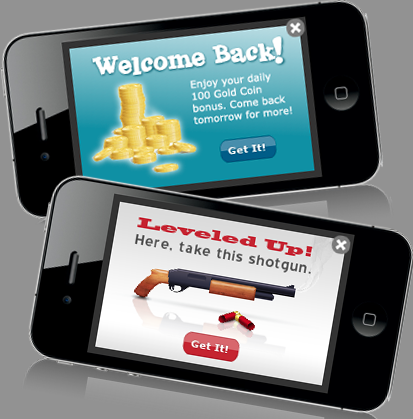 PlayHaven launched back in 2010 to try to bring app makers a little peace of mind by giving them complete control over their in-game marketing and monetization strategies. The startup’s HTML5-powered platform and SDK essentially enables mobile developers to quickly publish a variety of overlays through which they can serve rewards, virtual goods and promotions on the fly. They can then control and modify those overlays from a web dashboard, while leveraging the startup’s promotion network to hawk their app and reach users playing similar games. Now, two years into its development, PlayHaven is adding some more coin to its coffers in an effort to take its service international. The San Francisco-based startup announced today that it has closed $8 million in outside funding, led by GGV Capital, a firm that has also invested in the likes of Buddy Media, Cocoa China, Glu Mobile, Pandora, Square and WildTangent. The startups existing investors, including e.Ventures, Tandem Entrepreneurs and a handful of angels also participated in the financing. As a result of the round GGV Capital founding partner Hany Nada will be joining the startup’s board of directors. The new round brings PlayHaven’s total funding to over $11 million. With the new funding in tow, PlayHaven CEO Andy Yang said that the startup will be looking to invest aggressively in new markets, particularly in Europe and Asia, along with developing new consumer insights features (read: analytics) that will move PlayHaven along in its quest to become a “player lifecycle management” platform. It will be interesting to see if this is a model that will end up sticking for PlayHaven. As we’ve written previously, this isn’t the first business model iteration for the company, which started out by playing around in social networking for gamers, before later shifting its focus to developing tools which allowed app makers to create in-app and online game communities for free. The in-game communities could be integrated into iPhone apps by inserting a snippet of code, providing a sort of “community-on-demand” or community-as-a-service that could then be accessed from within the game and used to collaboratively develop guides, tips, reviews, and so on. 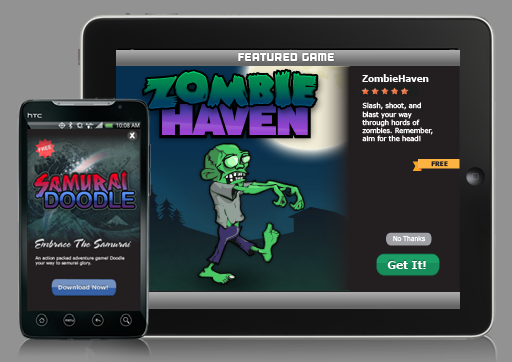 Even though this approach didn’t quite stick, PlayHaven has been able to curry favor from developers and now it’s squarely attacking what Yang believes is the biggest challenge facing mobile game development — monetization — by making it easy for developers to turn ads into profit, leverage a promotional network and tap into tools that help them boost engagement. PlayHaven’s traction with developers is, in part, what has appealed to investors, as Nada went on to say that the company seems like it’s now well-positioned to continue developing a business management platform for mobile games, giving app creators tools to acquire, retain, monetize and re-engage their users. Although the startup is going up against names like Tapjoy, Flurry and GetJar in this space, it’s still has managed to court “thousands of game developers and publishers,” according to its founders, including Glu, Game Circus, Natural Motion, Namco, Sega and Playtika — to name a few. For more, find PlayHaven at home here.